Whether you decided to beef up the Cover Flow on your iPhone with some iconic album artwork or you are finally going to whip your music library into shape, finding album covers online might require so much time, that in the end, you might give up on the idea. With mp3Tag Pro your favorite music artwork is just one click away. Mp3Tag Pro allows you to edit up to 50 audio files at once and searches for cover art in four online databases and on your computer. 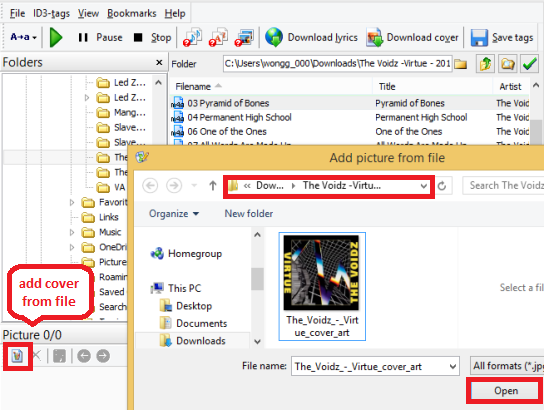 Below are quick and easy step-by-step instructions for both cases: whether you already have all the files with cover art on your computer, or you need to look for them online. Download mp3Tag Pro and follow the installation wizard, there's also a one-click installation option. The free trial version is valid for 30 days. Select the album from the 'Folders' menu on the left, the list of tracks will appear in the main window in the middle. Select one or multiple files. To select all the files click on the 'check mark' icon in the top right corner. 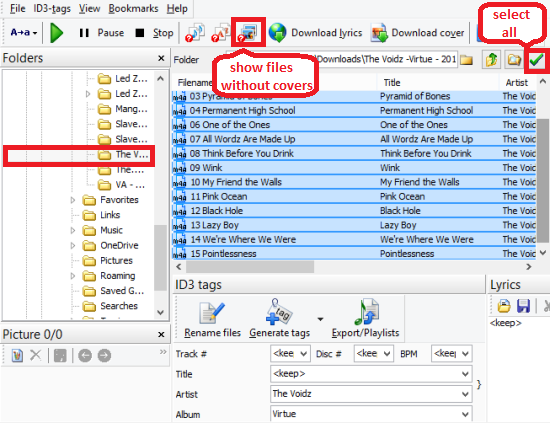 Sometimes files within one folder can lack different tags, whether it's the track's name, number or cover art. Mp3Tag Pro allows you to spot files with missing information in just one click. Use the button on top to show only files without covers. Select the files, that don't have cover art and click on the icon in the bottom left corner to open the window, that will allow you to navigate folders on your computer. Select one or multiple folders from the menu and open the file. You can work with as many audio files as you need simultaneously. Mp3Tag Pro also has a drag&drop feature, so you can simply drag an image into the program window. Android and iOS devices support *.jpeg, *.png, *.gif and *.tiff formats of cover art. 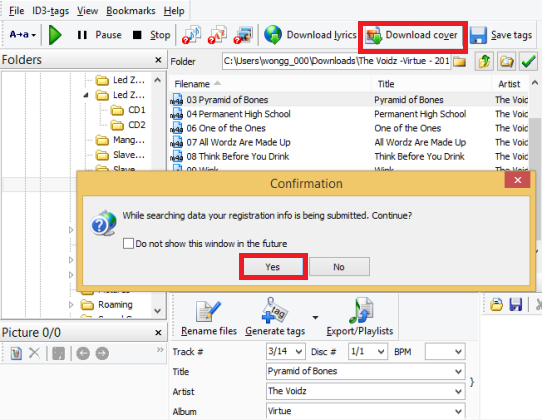 Mp3Tag Pro imports cover art from trustworthy online databases, such as Amazon, Discogz, MusicBrainz and FreeDB. The program will be looking for cover art related to each track's ID3 tags, so you need to make sure that your files have all the required information and 'Artist' and 'Album' or 'Artist' and 'Title' fields are not empty. If they are, check out our another tutorial to help you resolve the issue quickly: How Do I Get ID3 Tags From the Internet? Select one or multiple files, you'll be working on and press the 'Download cover' button on top, the program will notify you about your registration info submission. The downloaded covers will be displayed in the bottom left corner and will be automatically saved inside each audio file. 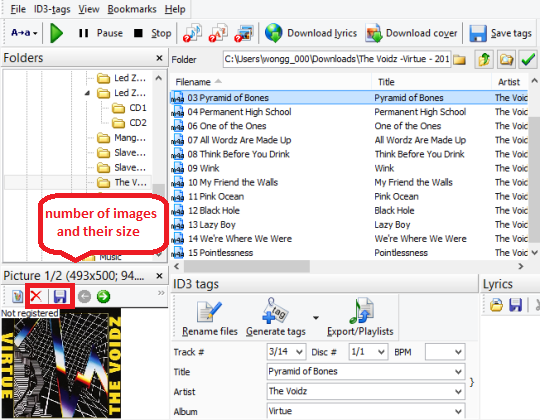 Mp3Tag Pro has an option of saving multiple images like album art, while the panel in the bottom left corner shows you the number of images, their size, allows you to navigate between them using 'arrow' icons, as well as delete them with the help of a 'cross' icon. 'Save' button will save the downloaded images in a separate folder on your computer.